'Tis the season! Finals are over, the sun is shining, the heat is rising. 'Tis the season to glow. Unfortunately, not all of us are naturally graced by that nymph-who-just-came-out-of-the-water kind of look. Especially if, like me, you have spent the past month studying like a maniac. Ah, well. My friend Jeanne cheered me up just the other day saying that all of us library people – creatures who stay indoors and have little contact with the sun – are still going to have amazing skin twenty years from now. Bless her heart. Now, let’s get back on track. I love highlighters. The only product I love more as a category is mascara, but that is a story for another time. I have tried several product in the last months, mainly because when I did find myself under the sun, I wanted it to shine on me; I wanted to look in a window and see a mermaid of the high seas staring back in the reflection. I tend to be a pretty basic gal with bouts of extravaganza. And, shimmering, shining highlighted cheekbones are my jam. However, I do realise that sometimes a more natural look is needed, so I have tried to keep that in mind while preparing this short, fully biased guide. La Touche Éclat by YSL - this is the product that introduced me to the concept of highlighter. I bought it for the first time when I was 17 and, ten years later, it is still in my makeup bag (not the same one, obviously... yikes!). One of the recommendations I would like to make is that it's best to let the product heat on your skin for a little while before you start rubbing it in – otherwise you’d just move it around without giving it the chance to set. Shimmering Skin Perfector (Pressed) by Becca - it might come as a surprise, but I only tried Becca for the first time this year, and I love it! I like the ‘Pressed’ edition more than the cream, which is shocking because usually a creamy texture creates a more dewy look. However, you need to consider that during the summer, you’d be wearing your SPF on top of your normal skincare and makeup routine. Now, maybe you do make adjustments, but for example, I am still wearing my liquid foundation, and if I wear to put another creamy liquid product, my face would melt in less than ten minutes after leaving my place. Hence, for me, powder is the way to go. 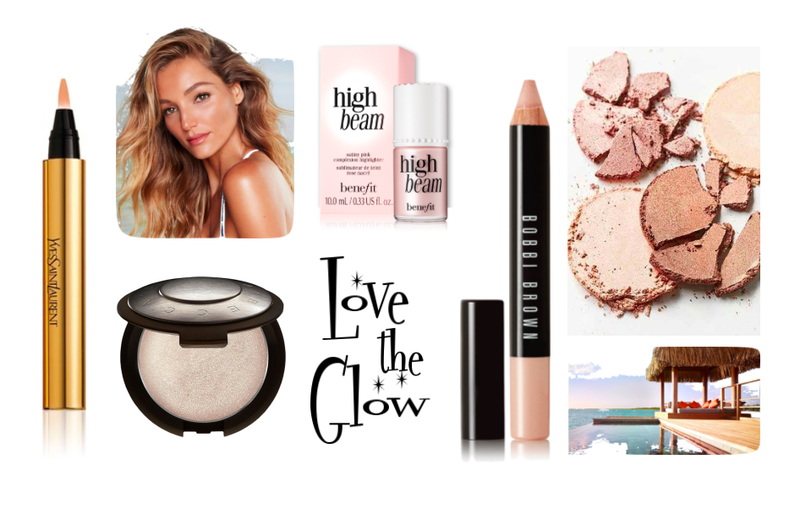 High Beam by Benefit – I purchased this product while visiting a friend in Paris at the Sephora in the Champs Elysées, at ten o’clock at night – which means that the place was so crowded we could barely breathe, let alone evaluate the tester product. I bought it anyway, and in the end I was glad. This liquid highlighter has accompanied me through the end of Winter and the beginning of Spring. It is a very ‘obvious’ product, in the sense that you can tell you have highlighter on, which is not a bad thing! I loved it for this reason because from February to April, there hasn’t been much sun, and in order for my cheekbones to glow under artificial lights, I needed that little extra help. If I had to make a small complaint, it would be that the bottle is not very practical once you’ve almost finished the product as it becomes difficult to gather the product on the brush. Bobbi Brown Retouching Face Pencil (Illuminate) – Of all the products this is possibly the least effective one for me, which is shocking considering that I quite like Bobbi Brown as a brand. The colour in itself is very pretty, and it does illuminate. The problem, however, lies in the consistency of the pencil: it is far too hard. When I try to apply it straight to my face, the area gets so red that at that point it’s all pointless; and, if I try to smooth it over, its denseness makes things difficult and my skin reddens again. The only way I can use it is if I apply a bit of product on the point of my fingers, add a bit of hydrating cream (just a tiny bit!) and only then it goes on the face. Of course, I don’t exclude the possibility that I am not using it right and somewhere there is a right way I am unaware of. If there is, let me know! Well, that's all from me. May the glow be with you!